It may have been just a coincidence, but our glorious summer has experienced more successful Hen Harrier nests on northern England red grouse moors since 2008 when 25 young fledged from 8 nests. This year 21 chicks fledged from just 5 nests. Hen Harriers breeding on the United Utilities Estates in the Forest of Bowland this summer have produced a bumper crop fledgling 13 chicks in total from 3 nests, broods of 5, 4, & 4 males). A 4th nest on National Trust moorland in the Derbyshire Peak District fledged 4 chicks. Today the Countryside Alliance have announced a 5th nest in the Yorkshire Dales National Park which fledged 4 chicks, making the most productive season since 2008. 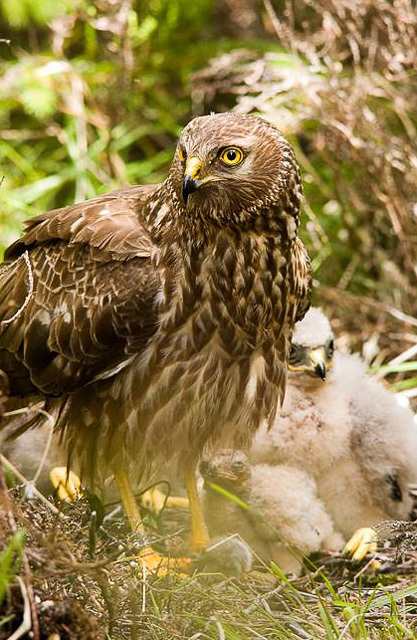 We were advised that at least 9 of the Bowland Harrier chicks had been fitted with satellite tags. The next 2 months will be crucial for the long term survival of all these fledged chicks, and the fledged Harriers from Yorkshire and Derbyshire. As many of these young Harriers migrate from their safe natal territories settling onto or passing through adjacent shooting estates in private ownership, their security based on the 2014 and 2015 seasons could be under threat. As witnessed in both the 2014 & 2015 seasons the disappearance of 7 Harriers, including two recently fledged chicks (Sky and Hope 2014) both fitted with satellite tags from the UU estate, followed in 2015 by the loss of 5 adult breeding male Hen Harriers, 4 from Bowland and a single male from Geltsdale. All the 5 male Harriers failed to return to their nests after flying off to forage and find food to feed their incubating female partners. The disappearances of each male then resulted in the failure of at least 25 eggs contained in their nests which went cold after each nest was then deserted by the 5 females. We are sure scientists who fitted the satellite tags to Harriers in Bowland and to additional Harrier chicks in Derbyshire and Yorkshire will be keeping a close eye on the movements of all these fledged Harriers from this years nests. It will be critical to monitor the movements of all this season’s chicks fitted with tags as they enter onto hostile moorland habitats, both inside the Forest of Bowland and elsewhere to ensure their continued wellbeing into and beyond the winter. Information from the parts of the Scottish Highlands are telling us many pairs of Hen Harriers this year were made up of immature birds, both male and female. If this detail is correct this could point to the fact that adult mature birds of both sexes were very thin on the ground. On the other hand information from Bob McMillan from Skye Birds reports more successful Hen Harrier nests this year on the inland than in previous seasons, with few if any failures after nest visits to examine and ring chicks were curtailed. 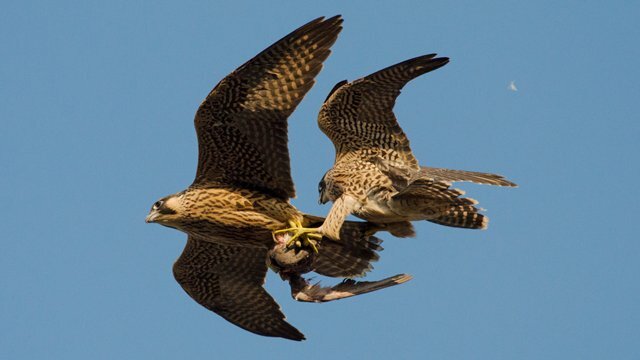 The North West Raptor Protection Group are aware of two Peregrine nesting attempts made in the Forest of Bowland this year, both of which were established on moorland owned by United Utilities PLC. One of the two nests was successful fledging 4 young. Unfortunately the second nest contained an unknown number of eggs failed in early April after the clutch of eggs disappeared within just 14 days of being laid. 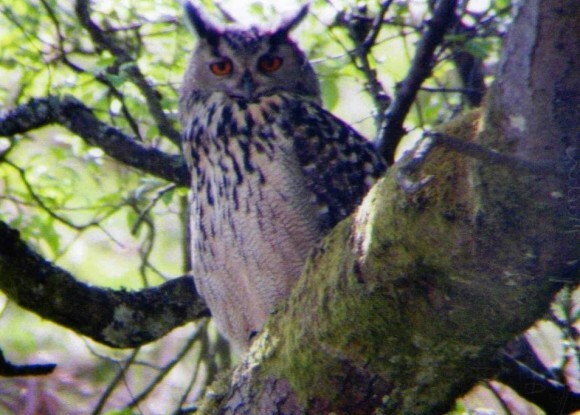 Eagle Owl Forest of Bowland. It is being reported there were two EO nesting attempts made on the United Utilities estates by different pairs located several miles apart. 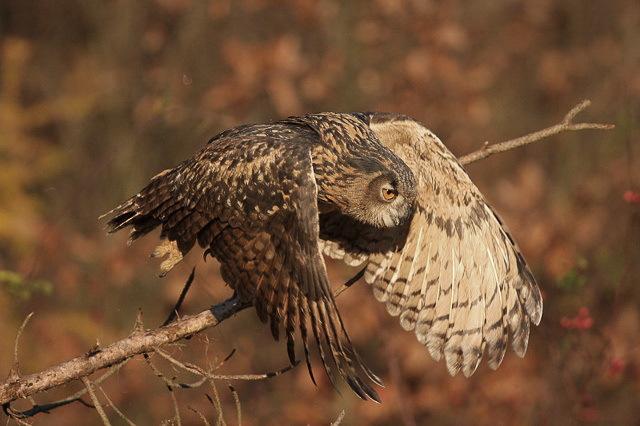 The first nest may have been abandoned after being visited and disturbed when containing eggs by two unidentified males in early April (eye witness report). We have not heard of a repeat breeding attempt for this pair, so perhaps we should be prepared to accept the worst. The second pair where more successful managing to hatch and fledge at least 2 owlets. 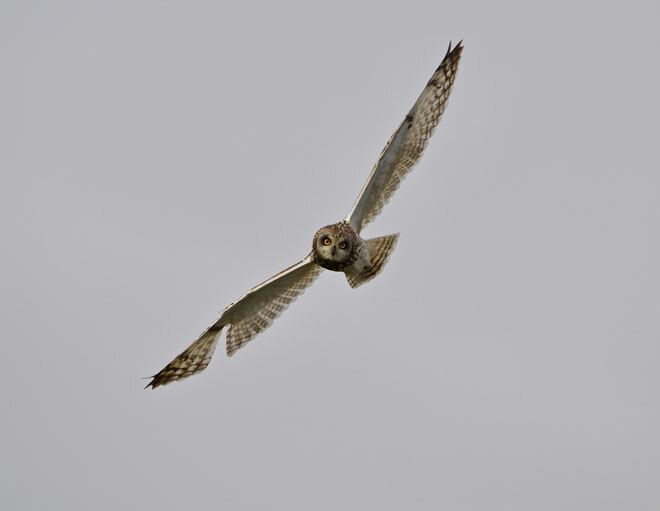 Image of what appears to be a primary feather shot out of a wing of a Short-eared owl flying above moorland in the Forest of Bowland this year. Excellent and progressive piece of news regarding the hen harrier. Hopefully this is the foundations for improvement in England? Great news!! No doubt this wouldn’t have happened without all of the campaigns that have been going on to help to stop the gamekeepers slaughter of these amazing birds. Great news but only 3 of those birds have had satellite tracking devises fitted. For such an endangered species money should be made available to tag every bird. Maybe without tracking any birds disappearing it will be less embarrassing for the powers at be. Editor’s Comment. How right you are Chris, the fact that 10 fledged hen harriers from the three Forest of Bowland nests were not fitted with a satellite tag was a huge error of judgement on someone’s part, after all the money was always there. Now as you say no one will ever discover the true fate of the ten birds, unless of course a dead corpse is discovered which still retains a BTO ring. The chances of that ever happening are in my view are nil. Its as though someone in authority and charged with looking after these birds did not wish to find out if they were killed after fledging or not, which based upon past examples was highly likely.